Set at a quintessential New England private summer community this laid back fun celebration came complete with a rocking New Orleans style Brass Band processional, a harvest moon, oyster bar, sparkler exit and plenty of seaside charm. Sounds like our kinda celebration! With a colour palette of sage green, navy, cream, and eggplant, the bridesmaids wore navy, raw silk dresses and carried bouquets filled with white peonies, ranunculus, alliums, and greenery with sprigs of lavender. For the reception they had wooden farm tables lined with garlands which tied into the arrangements on the cocktail tables and in the bouquets. 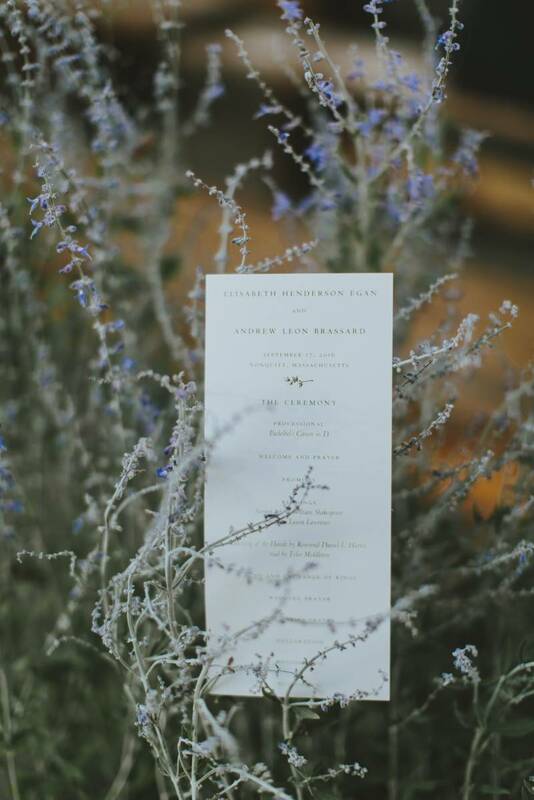 They mixed in white and french grey pumpkins; scattered to line the aisle for the ceremony, medium ones marked with gold table numbers, and mini ones with guest names tied to each for the seating assignments. 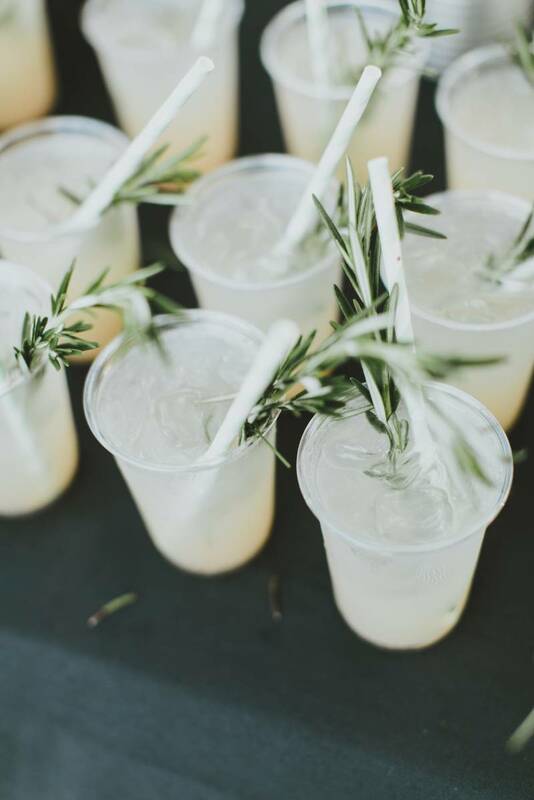 To start they served a signature drink - a delicious and refreshing grapefruit paloma and then guests enjoyed a family-style dinner. HENRY AND MAC captured these beautiful images of their day. 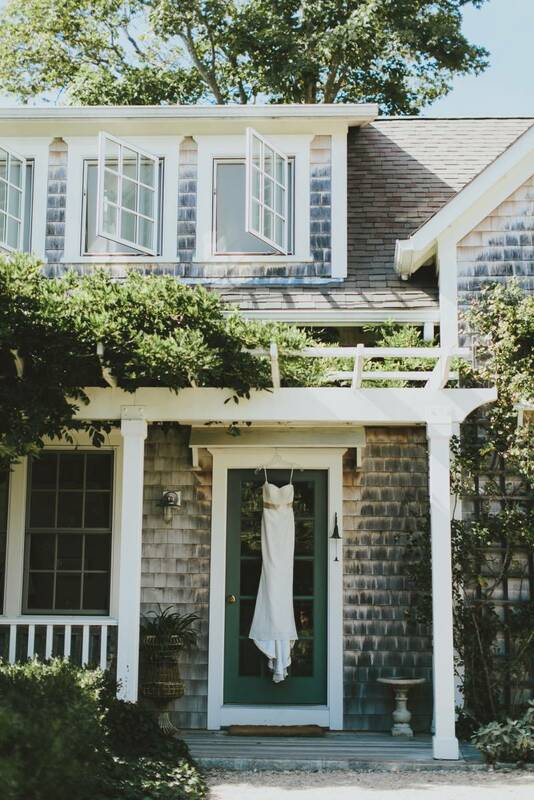 The bride tells us a little more about their day, "We were married in Nonquitt, a private summer community in South Dartmouth, Massachusetts on Buzzards Bay. I spent my childhood summers there; going to camp, riding bikes, playing tennis, sailing, attending weekly cookouts and nightly 'fun and games', and enjoying countless hours on the beach and in the ocean. Nonquitt is a throw-back to a different era (think 'Dirty Dancing'!) where time seems to stand still. You can't help but fall in love with its beauty, charm, and simplicity. Over the past 4 plus years, Andrew and I have regularly escaped Boston for many summer weekends in South Dartmouth, and he has come to love and appreciate Nonquitt as much as I do. We wanted our wedding to reflect this feeling The intimate ceremony was officiated by my childhood minister and held on a cliff above the beach, overlooking Buzzards Bay out to the string of Elizabeth Islands. Immediately following, Andrew and I were led by our band along with our 175 guests on a 'second line' - inspired procession from the beach to the Nonquitt 'casino' porch and golf course where cocktails, raw bar, and hors d'oeuvres were served. 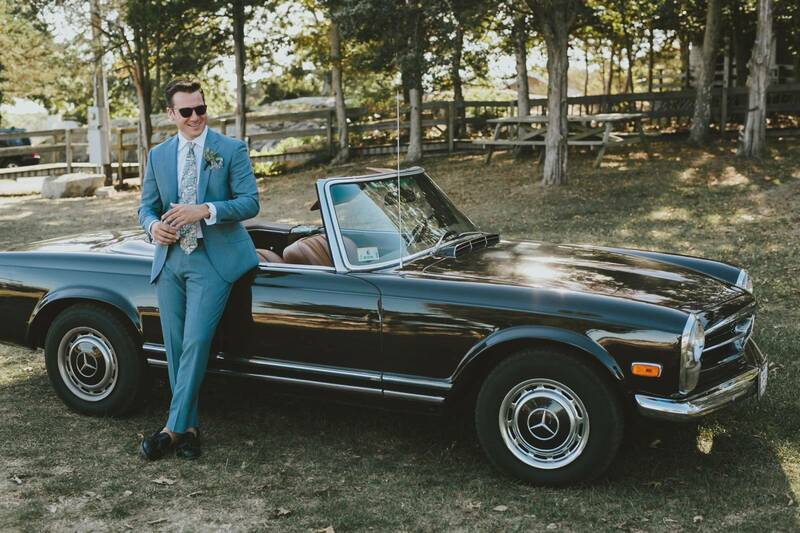 We used cocktail hour to take photos - family and wedding party on the golf course and portraits back by the beach where Andrew & I hopped in my grandfather's 1968 Mercedes convertible and went for our our first drive as newlyweds. We caught the tail-end of cocktail hour as guests were being ushered into the white, sailcloth tent on the lawn. The celebration continued with our first dance to Alabama Shakes 'I Found You', hilarious and memorable toasts, a delicious family-style dinner, and non-stop dancing from the minute the 9-piece band took the stage." HOW DID YOU MEET? My oldest childhood friend went to Boston College with Andrew and introduced us at a BC football tailgate. We hit it off that day but didn't reconnect until a few years later when he showed up at a charity event I had organised and asked me on the first of many dates to come. TELL US A LITTLE ABOUT THE PROPOSAL: Andrew proposed the day after Christmas at Barney's Joy beach in South Dartmouth - my favourite place in the world. He popped the question at the top of a sand dune with our beloved blind pug, Bode, by his side. The day ended at the Buzzards Bay Brewery where we were surprised by close family and friends and celebrated with local beer and oysters. TELL US ABOUT FINDING YOUR WEDDING DRESS: My wedding dress was designed by AMY KUSCHEL, and it's appropriately called 'The Boston'. The dress is a formfitting, trumpet silhouette with a strapless, sweetheart neckline. It is made of 60's garden lace. I added a taupe, satin ribbon at the waist for a contrast of color and texture. WHAT ADVICE WOULD YOU GIVE TO A COUPLE GETTING MARRIED? We wanted the style of our wedding and reception to feel timeless and chic yet fun, warm, and casual. It took editing - and that would be my one piece of advice to couples planning a wedding. Although they can be great resources, you can easily get carried away with the details and 'theme' thanks to pinterest, etsy, and all the blogs out there. One thing I always kept in mind is 'less is more' - you can never go wrong with an understated approach. We really embraced our location and did what we could to compliment its natural beauty. WHAT WAS YOUR MOST MEMORABLE MOMENT: This came at the end of the evening - after exiting through a tunnel loved ones donned with sparklers - when Andrew & I jumped back into my grandfather's car, and the two of us took a private drive along the water under the full moon (no joke - there was a full moon that night!) which completely lit up the sky. It was then that we could look at each other as husband and wife and truly absorb the magic of the day. FAVOURITE DETAIL OF THE DAY: Our getaway car! The bride's grandfather's 1968 Mercedes 260 SL convertible all decked out with tin cans and a just married sign. IS THERE ANYTHING YOU WOULD HAVE DONE DIFFERENTLY? I honestly do not think Andrew & I would have done anything differently. We had the most beautiful weekend and would re-live it all over again if we could. We are looking forward to celebrating our one year anniversary with a piece of wedding cake and some champagne - quite possibly in the hospital as our first baby is due on September 10th!